Donors sent in $29,775 as of Monday for the recovery fund of the University Laboratory School, which lost a building to arson. Damage from the June 13* fire has been estimated at $6.5 million. The University of Hawaii Foundation is receiving the donations by phone at 956-8849, online at www.uhf.hawaii.edu and by mail (contributions should be marked for the "Fire Recovery Fund") at P.O. Box 11270, Honolulu 96828-0270. Lifeguards treated at least 33 stings in the Waikiki area yesterday as box jellyfish continued their monthly invasion of south shore beaches. About 144 box jellyfish were observed on beaches off Waikiki as of 2:30 p.m. yesterday, according to Bryan Cheplic, spokesman for the Emergency Services Department. Earlier that day, lifeguards spotted 75 box jellyfish along the Waikiki shoreline, Cheplic said. Three jellyfish were observed at Ala Moana Beach, but there were no stings reported in the area, Cheplic said. The box jellyfish warning continues today in Waikiki, Pokai Bay, Makaha Beach and Waimea Bay. Those who are stung are advised to flush the area with white vinegar. Lifeguard stations are also equipped to treat stings. Anyone experiencing symptoms that include difficulty in breathing, muscle cramps and/or persistent pain should seek medical attention. 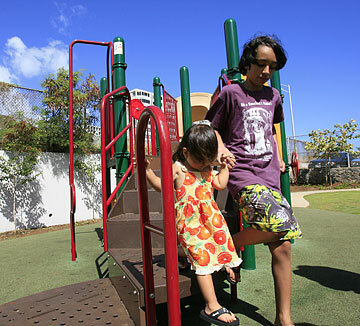 Noa Helela, 12, helped his half sister, Li'a Kato-Teale, 2, down from new playground equipment yesterday afternoon at a neighborhood park on Pele Street near Punchbowl. Children living on Pele Street just above Vineyard Boulevard will no longer have to play next to whizzing cars since a mini-park was opened yesterday. The project to construct Pele Street Park on a vacant, state-owned yard was begun four years ago by the city, state and residents. "There is no other open area in this neighborhood that would provide for safe recreation," Mayor Mufi Hannemann said. The city decided to move ahead partially because of the affordable $171,000 cost and maintenance by an adopt-a-park program, Hannemann said. Contractor Site Engineering Inc. installed drinking fountains, a chain-link fence, concrete walkways and playground equipment. Fifteen-year-old Annie Semens, who played near the Pele Street traffic while growing up, said the park "is much better (and) safe for running around." » A building at University Laboratory School was destroyed by fire June 13. A news brief on Page A3 in yesterday's morning edition incorrectly stated that the fire was on June 12. Two Hilo men apparently drowned in separate incidents this week while diving in waters off the same beach in Keaukaha. Big Island police said the two men had been diving at Leleiwi Beach Park. Police identified a 23-year-old man who apparently drowned yesterday as Paul Lam, a recent graduate of the University of Hawaii at Hilo. The first victim, identified by police as Yoseph Albos, 47, of Hilo, apparently drowned Sunday. Police said Albos had been diving with a friend at the park about 1 p.m. when the friend noticed Albos was in distress. The friend tried to help him and then called 911. Fire rescue personnel tried to resuscitate the man but were unsuccessful. They took him to Hilo Medical Center, where he was pronounced dead at 2:17 p.m.
Lam's parents, who were visiting from China, reported him missing shortly before 2:03 p.m. yesterday, police said. When police arrived at the scene, Lam's parents informed them that he had been free-diving and taking photos while they went out on a half-hour scuba dive class at 11 a.m.
His parents told police they assumed he had still been diving when their class ended. A Fire Department helicopter assisted police in searching for the missing man. Bodyboarders found him at about 2:40 p.m. floating face down at "Four-Mile Beach," a half-mile north of Leleiwi. Fire rescue personnel airlifted him out of the water, but were unable to resuscitate him. Lam was taken to Hilo Medical Center, where he was pronounced dead at 3:05 p.m.
An autopsy will be performed to determine the exact cause of death. WAILUKU » A 52-year-old Maui woman died Monday night after the pickup truck she was driving crashed into a traffic signal pole in central Maui. Karren Anne Esposito, of Haiku, was headed toward Kahului on Mokulele Highway when her truck went off the east shoulder of the road and struck the traffic pole at Kamaaina Road at 9:04 p.m., police investigator Duke Pua said. Pua said Esposito was wearing her seat belt at the time of the crash. She died at Maui Memorial Medical Center. Esposito was the ninth traffic fatality in Maui County, compared with four during the same period last year. Big Island police say a burglar or burglars set fire to the library at Waiakea Middle School in Hilo over the weekend. An employee discovered the break-in at the campus at 200 W. Puainako St. about 8:15 a.m. Sunday, police said. Police said the suspect or suspects ignited a fire in the library but the fire didn't go far. Police said damage was minimal. Following an inventory, police learned that computer components were stolen during the burglary. Police are investigating the case as second-degree burglary and second-degree criminal property damage. Anyone with information is asked to call Detective Greg Esteban at 961-2384 or CrimeStoppers at 961-8300 in East Hawaii or 329-8181 in West Hawaii. A retired Honolulu police officer helped recover items stolen from a man's car in Waianae on Monday. Police said the retired officer saw a man break into a parked vehicle about 5 p.m. and then take off in another vehicle driven by another man. The retired officer provided the license plate number and description of the vehicle to police dispatchers and within 20 minutes officers stopped the vehicle in Waianae. The 21-year-old man whose car was broken into was called to the scene to identify the stolen items. The passenger in the getaway car fled, but police arrested the driver, a 23-year-old man, for investigation of unauthorized entry into a motor vehicle.